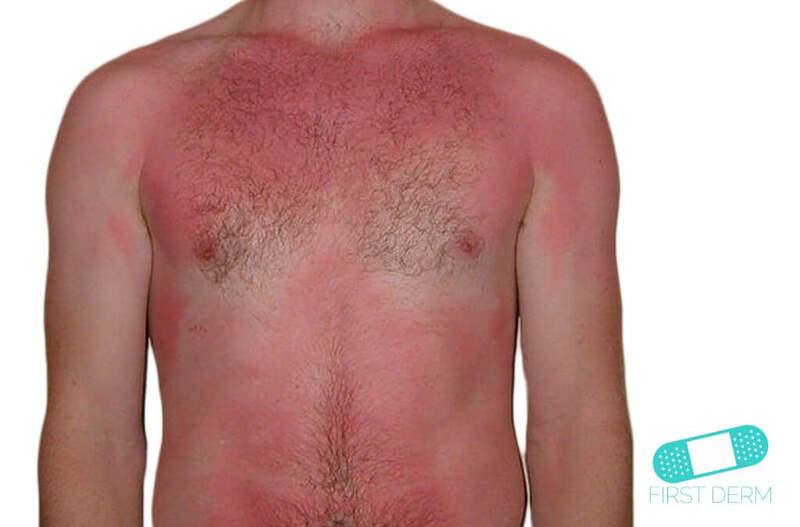 When skin is exposed to the sun for too long, it becomes red and irritated. This is a sunburn. If the sun is severe enough, the skin will react against the sun’s UV radiation and become blister and peel, turning into a sun eczema. Sunlight contains different kinds of radiation. The ultraviolet radiation is divided into UVA radiation, which makes the skin pigment darkens, and UVB radiation, which means that the amount of pigment increases and the skin becomes thicker. Both types of ultraviolet radiation can cause skin damage. UV light from the sun damages skin cells and causes DNA damage beneath your skin, which could lead to skin cancer. Sunburns speed up the aging process of the skin, creating wrinkles and dark spots. Babies and small children should not stay in the sun at all, but sometimes even at a shady spot, it can be too much glare for sensitive skin. Sunburns cause the skin to turn red, swell, itch, and heat up. You might experience chills, nausea, and headache can occur with a severe burn. Your skin type and the sun’s intensity determine how soon you will burn and how severe the burn will be. If you get sunburn, you should refrain from sunbathing for a few days to let the skin heal. If the skin hurts a lot, you can cool it with cold water, calamine lotion or a moisturizing lotion. If you get sun eczema, you can relieve the pain with a prescription hydrocortisone cream. If you experience a lot of pain, you can take a non-prescription painkiller. You can protect your skin from sunlight by opaque clothing and a hat. It is advised that you use sunscreen with a high sun protection factor that protects against both UVA and UVB radiation. As the clouds transmits half of the sun’s radiation, you should use sunscreen even on a cloudy summer day. Put on a new layer of sunscreen several times during the day, especially after swimming and if you sweat. There are different types of sunscreens, and you can ask the pharmacist for more information. You should also be wary of the sun if you are using certain medicines, as they can increase the skin’s sensitivity to ultraviolet radiation. Also, remember that snow, sand and water reflect sunlight. After sunburn, the skin starts to heal itself by peeling a few days. If you get a severe eczema or a severe sunburn with blisters on your skin or damaged skin area that is larger than the palm of a hand, you should seek help from a healthcare provider. Limiting sun exposure and wearing sunscreen are the best ways to avoid a sunburn. Cold water or calamine lotion might be soothing to a sunburn. Hydrocortisone cream can ease the itching that can occur in sunburns and sun eczema. Skin Cancer Foundation. Sunburn. Available at: http://www.skincancer.org/prevention/sunburn. Skin Cancer Foundation. 5 Ways to Treat a Sunburn. Available at: http://www.skincancer.org/prevention/sunburn/five-ways-to-treat-a-sunburn.